How Difficult Is It to Learn Kitesurfing ? Kitesurf schools make it sound quite easy. Some say kitesurfing only takes a couple of days to learn, while others say it’s actually quite hard to learn. As a prospective kitesurf learner, you need to know what the real deal is, don’t you? How difficult is it to learn kitesurfing? While you can learn to kitesurf in a few days to a couple of weeks, the learning curve is steep. You need to acquire two different and interacting skillsets, kite flying and board riding. Both involve strong coordination and balancing abilities. Learning them can be done in a short time but requires intense efforts and some endurance. In the rest of this post, I’ll examine the main aspects of learning to kitesurf and the level of difficulty each aspect involves. See also how long does it take to learn to kitesurf? Before looking at the difficulty of learning each skill involved in kitesurfing, let me briefly mention some of the conditions that can make your learning process much more difficult. First is the wind! You may think rough winds are the worst for learning, but it’s actually the opposite. Really light winds, say under 12 knots, will make learning much harder for you. Flying a kitesurf kite in light winds in very technical, even with a bigger kite. You’ll keep dropping your kite because of beginner mistakes. Second is the water. This applies to the second part of your learning process – initially, you’ll be acquiring piloting skills on the beach. Waves, chop, and current will all get in the way of your learning. I know what I’m talking about, rough water conditions have made it quite difficult for me to get through the water start step. Third is the equipment. 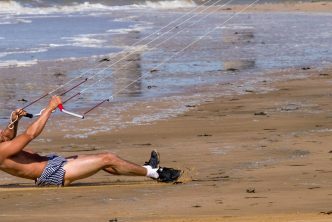 If you have too small a kite in relation to wind speed, you’ll keep crashing it – this is similar to the low wind issue. If your kite is too big, you’ll be overpowered, which can even be dangerous. You need just the right size kite for the conditions. A good instructor should advise you on that. Also, a bow kite will be easier to learn on than a C kite. As for the control bar, try to get one with a safety release system that doesn’t go off by itself! That’s quite common especially with older equipment and will rot your learning experience. Instructor: while getting some lessons is really important for learning kitesurfing, be sure to choose a kitesurf instructor who can really communicate (and if possible in a language you understand! ), else your learning process will be much harder. With that out of the way, let’s get into a bit more detail about how hard the main kitesurfing skills are to learn. How difficult is it to understand the wind? This depends on the way your brain is wired. Some learners find it really tricky to visualize that abstract “wind window” which is a 3D representation of the amount of wind power in relation to your kite’s position in the sky. Yet it’s probably the most concrete way of representing and understanding what happens to your flying kite when you move it around. The conceptual side of this is not hard to understand. The hard part is putting it into practice. As you get all worked up trying to control the kite as it picks up speed and is about to crash, you tend to completely forget about the theoretical “window”, neutral and power zones etc. You just go into survival mode and do whatever action your brain tells you to do on the control bar, typically leading to the dreaded crash or to an unwanted body drag. So again, understand the wind theory is quite easy, but using it in action is another story. It requires some time and practice to build up reflexes and muscle memory. How hard is it to learn to pilot a kitesurf kite? This is related to the previous section, as understanding and internalizing the 3D wind power abstraction is kind of a prerequisite. Learning to fly the kite, starting on a trainer kite and continuing on a kitesurf kite, is initially quite intuitive: tilting the control bar left and right steers the kite left and right. You quickly learn to make “8” figures in the sky, and you start feeling some traction as you fly from one half window to the other. Where things get harder is learning the right amount of forward/backward pull on the control bar: in addition to tilting the bar right or left, by bringing it down or pushing it out you control the amount of tension in the back lines, which in turns determines the amount of power. How difficult is it to learn power dragging ? Learning to power drag in the sand (aka “sand skiing”) is not so hard once you’ve learned to control the amount of pull on your back lines, that is, to keep the control bar midway between its lowest and highest positions as you tilt it left and right. The difficult part when practicing body drag is going in a relatively straight line. When you steer your kite from one half window to the other to generate power and traction on your harness, you tend to get dragged to each side as well. Timing is key to avoiding the kite going too far down before the next turn – that’s a bit tricky to master. Learning to body drag in the water is easier at first since you just throw the kite into the power zone and let it sweep you downwind. Body dragging upwind, however, requires more subtle, one-hand steering, and maintaining a “fin” position in the water with your free arm. This is another slightly more challenging step to learn in kitesurf. How difficult is it to water start ? Once you got used to powering up your kite and getting dragged, your next step is to leverage that traction to get up and moving on your board. This is one of the most challenging steps as you need to simultaneously focus on two completely different things, your kite and your board. Initially, you have both your feet tucked into the board straps, and you’re trying to maintain that crouched floating position while you start moving your kite into the power zone. Next, you get jammed upward and forward by the kite, and you have to push hard on your legs to get up while avoiding getting thrown forward. This requires a significant dose of both balance and coordination. For most people, this skill takes a few hours and some unpleasant faceplants to pick up. How difficult is it to ride downwind ? Once you’ve got the water start skills down, riding downwind is a relative breeze in comparison. That is, now that you’ve learned how to get up and moving on your board, you want to keep riding for a moment. The challenge here is to keep tension in your lines, which is what most learners initially fail to do: the natural tendency is to ride in the same direction as the wind and towards your kite, resulting in line slack as your board picks up speed, and your kite eventually dropping. So while you do feel the thrill of actually riding while pulled by your kite, it’s often a very short-lived moment as you end up losing power and speed. When that happens you have no choice but sit back in the water, and relaunch your kite if it has dropped. How difficult is it to ride upwind ? Once your know how to ride downwind, the final step in the learning curve is to learn upwind riding. Most people learn this last skill on their own, as it typically requires hours of “paying your dues”, which can be often done without the help an instructor. I wouldn’t say learning to kitesurf upwind is hard, but it takes time. 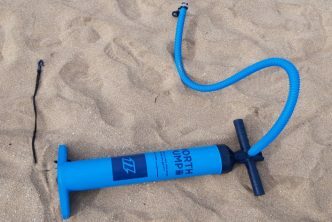 Thing is, with each attempt you’ll initially end up going downwind quite far instead of upwind, which means you’ll have to walk back up the beach with your kite up in the air. Again, that’s not a difficult endeavor but it requires a lot of time and energy. For each attempt (in between upwind walks up the beach), you get little effective time to practice edging your board to go upwind. At one point, however, things suddenly click and you succeed in creating that necessary opposition between your kite and board’s directions. How difficult is learning to kitesurf compared to other board sports ? While some board sports skills translate into kitesurfing, not all of them do. Many windsurfers actually complain that their windsurfing habits get in the way of their kitesurfing learning process. I can see that happening, for example, because a windsurfer needs to constantly pull on the wishbone to pick up speed, while in kitesurfing, pulling the bar in doesn’t always create more power – it can actually have the opposite effect depending on your kite’s position in the window. Snowboarding experience can come in handy for acquiring the right skills on your kiteboard, since you’ll already be familiar with sliding on a board strapped, as well as digging in your board’s rail – which is key to riding upwind. Wakeboarding experience can also help to reduce the kitesurfing learning curve. Some advanced wakeboarders, however, feel hindered by the difference in pull direction – in wakeboarding the pull from the boat is horizontal, while in kitesurfing the pull is a lot more vertical. This results in different stances and body positions, and can actually make learning kitesurfing more challenging for a seasoned wakeboarder – not mentioning learning the kite flying skills specific to kitesurfing. What Does it Feel Like to Kitesurf ?